Two children died when a passenger boat capsized after colliding with a fishing vessel in Lake Victoria in western Kenya. A local official said fishermen responding to distress calls had rescued 21 of the 23 people on board the passenger boat and recovered the children's bodies. There were no casualties on the fishing vessel, which also capsized. The accident happened at about 02:00 on Wednesday morning (Tuesday 23:00 GMT). 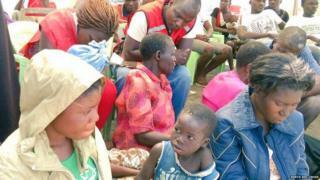 A Kenya Red Cross team has been helping in the rescue effort and giving first aid to survivors. Fishing boats are often to be found on Lake Victoria in the small hours because the waters are calm at that time, Kenyan media say. Earlier reports had suggested the passenger boat was carrying 200 people. But a local government official downgraded that figure to 23, and this was confirmed by a boat owner who responded to the distress calls. Both boats have now been recovered from the lake.